OLD PARKED CARS. 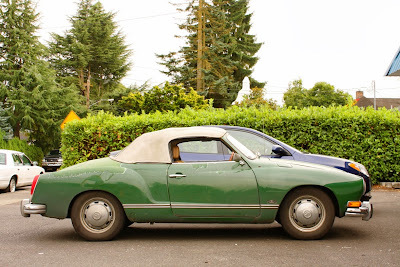 : 1973 Volkswagen Karmann Ghia Convertible. 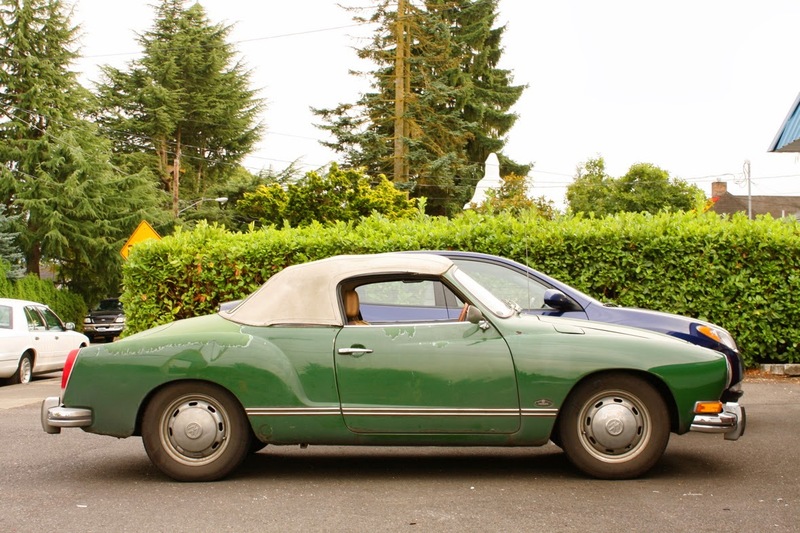 1973 Volkswagen Karmann Ghia Convertible. Wait, aren't these more common than Celebrities? I don't see myself ever documenting one of these again. Is it the funny rapidly oxidizing paint you're appreciating, or the straightness? let me respond to all three of your sentences. 1. no, these are not more common than chevy celebrities, and heavily patinated kg's are a truly rare sight--unlike the celebrities, which tend to feature abundant patina. 2. but yeah, you're still right--as far as "classics" go, these are pretty common, not to mention fundamentally unremarkable. they don't usually count as opc's. 3. so yes, it's the dessicated clearcoat and the stained and worn convertible top that makes it something special, coupled with the fact that this is someone's 365-daily driver. 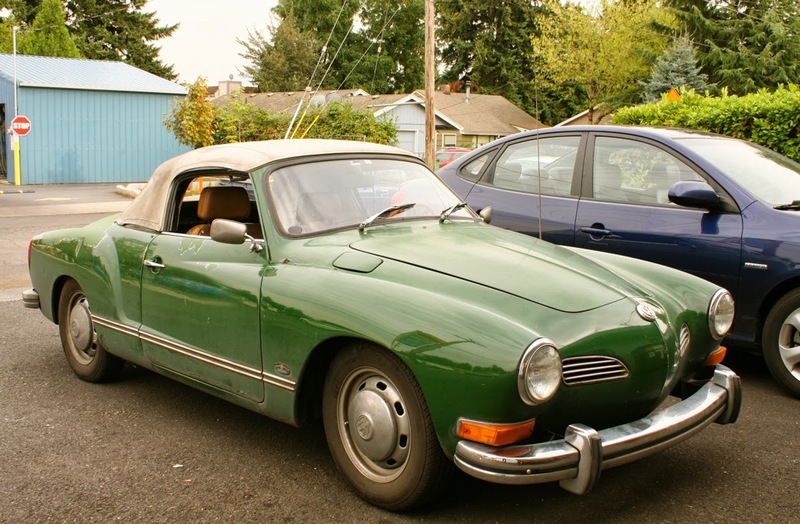 as a side-note to my second comment, if i had to choose a vintage low-performance european sports car, you better believe i'd choose a kg over a mercedes-benz 190sl. 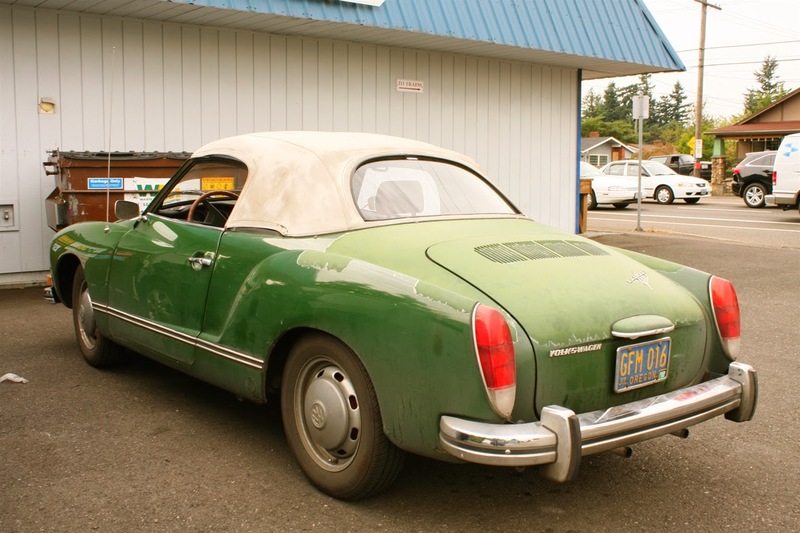 Yeah, my first thought was "really, a Karmann Ghia?" Then, once the pictures loaded, "wow!". Fantastic color, and the patina is exceptional. Especially that yellowed (browned?) white top. Man, the taillights for that particular year were enormous! They look goofy. All the later model AC VW's had huge taillights like that. You can thank US safety regulations for that. Early VW's had very small taillights. My '60 bus has silver dollar sized tails. They made more Celebrities, but how many are still driving 2013?